It's best to avoid piling on the options; otherwise, the price of the Colorado can easily pass the $20,000 mark. At that price, the mid-size Colorado edges into full-size truck pricepoints and loses its value proposition. TheCarConnection.com's reviewers drove the latest 2010 Chevrolet Colorado and combined first-hand accounts with other reputable sources to provide you an expert, all-encompassing opinion with the most useful, pertinent details. The 2010 Chevrolet Colorado continues to be offered with a wide variety of engines, including four- and five-cylinder mills, plus a range-topping V-8 engine cranking out 300 horsepower and 320 pound-feet of torque. Along with a sub-seven-second sprint to 60 mph, the Colorado can tow up to 6,000 pounds. Reviewers generally find the base 185-horsepower, 2.9-liter four-cylinder engine and the optional 242-hp, 3.7-liter five in the 2010 Colorado are not up to the mark, and the latter is an especially disappointing upgrade. It's rough, noisy, and it doesn't have the refined performance that some of the Colorado's rivals offer. 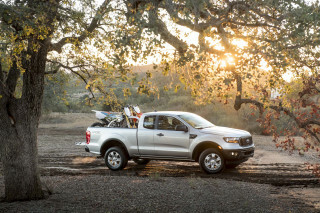 Meanwhile, the available V-8 turns the Colorado up to 11, and TheCarConnection.com's reviewers recommend it for drivers in need of towing ability. 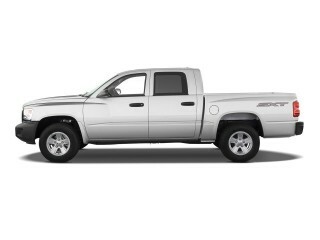 The 2010 Chevrolet Colorado is also available in either rear- or four-wheel drive. Matching the variety of powertrain options are several different body styles for the 2010 Chevrolet Colorado. These include a regular Cab, Extended Cab (with short reverse-opening doors), and Crew Cab (with four regular forward-swinging doors). 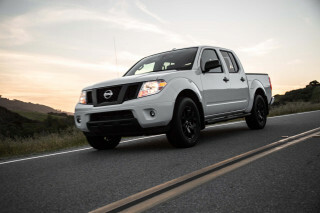 Crew cabs come with a five-foot cargo box, while other Colorados feature a six-foot bed. On four-door versions, the uncomfortably upright rear seats are just spacious enough for two adults. 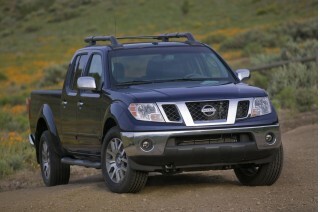 However, the four-door crew-cab version can seat six passengers in a pinch. The interior for all Colorados is nowhere close to impressive, with cheap, hard plastic as the theme. It must be noted, however, that inside the ZQ8-equipped models, unique seats unavailable in other Colorado models are rather nice. Standard equipment is decent with air conditioning, a tilt steering wheel, cruise control, and folding exterior mirrors all included. Options include traction control, XM Satellite Radio, fog lamps, leather seats, a sunroof, a six-CD changer, and a sliding rear window. OnStar is offered but without a navigation feature—which would enhance the desirability of this work truck. The 2010 Chevrolet Colorado's interior is great on the aesthetics, but the cheap materials are tremendously disappointing. 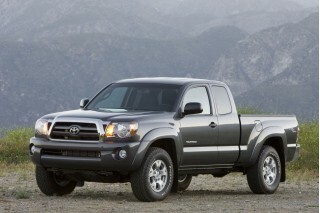 The 2010 Colorado's exterior styling remains unchanged year over year, thought there are trim revisions. You can choose between numerous styling elements throughout the Colorado's varied configuration. Ruggedness and capability are communicated by the Colorado's aggressive styling, Edmunds claims. Automedia likes the Colorado's styling, too, deeming the mini Silverado-look terrific with its sporting, rugged stance. Kelley Blue Book lauds the Colorado's look-at-me fender flares that break up the monotony of tall slab sides. 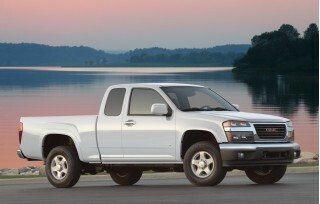 The 2010 Chevrolet Colorado is a matter of huge debate; most reviewers love the aesthetics but hate the materials. Edmunds finds the new Colorado more hospitable, though hard plastics and marginal build quality show evidence of corporate cost-cutting. Car and Driver slams the Colorado's interior as "rental-car interior decor." Alternatively, Automedia finds the Colorado's interior apes that of a much better appointed full-size pickup and Kelley Blue Book describes it as "highly functional, with all the gauges and controls in clear sight and easy reach of the driver," even if its home to a sea of gray. Meanwhile, ConsumerGuide is a fan of the Colorado's simple and clear climate and audio controls, and easy-to-read gauges. The 2010 Chevrolet Colorado scores a lot of points with the V-8 engine and ZQ8 suspension, but that may not be enough to overcome the competition. The 2010 Chevrolet Colorado's V-8 engine is heralded not only for the additional power, but also its smoothness, though one may wonder whether the premium is worth it considering it doesn't add much towing power. The V-8 is the antidote to the Colorado's thrashy four- and five-cylinder engines, Car and Driver says, but the larger mill can only tow an additional 500 pounds versus the more frugal. Automobile Magazine put the V-8 to good use, finding it good for 60 mph in 15.9 seconds and 11 mpg while towing a 5,150-pound boat and trailer. ConsumerGuide found just adequate power from the smaller I-4 and I-5 engines with no reserve for towing heavy loads or passing. Truck Trend counters by stating both engines offer reserve power at higher engine speeds should you need it, and Kelley Blue Book claims consumers will appreciate the Chevrolet Colorado's "good power and excellent fuel economy." The Colorado's ZQ8 package—which lowers the truck by one inch, stiffens the springs and anti-roll bars, and adds quicker steering and Goodyear Eagle RS-A tires—is for those who want the utility of a truck but the driving characteristics more tuned like a car, Automobile Magazine claims. The new suspension doesn't win any marks with Car and Driver, with its reviewers finding it bouncy and classic-feeling (in the negative sense). It also found the tightened-up steering offered by the ZQ8 package to lack feel. 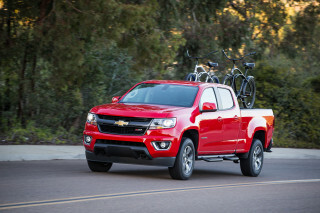 Edmunds disagrees, praising the package's composed on- and off-road handling of the 2010 Chevrolet Colorado, also noting the standard suspension is tuned for a softer, more comfortable ride. The 2010 Chevrolet Colorado's competitiveness is hindered by its cheap interior materials and limited load capacity. Body styles of the 2010 Colorado include a regular Cab, Extended Cab (with short reverse-opening doors), and Crew Cab (with four regular forward-swinging doors). Crew cabs come with a five-foot cargo box, while other Colorados feature a six-foot bed. For those who need rear space, the longer six-foot bed can't accommodate a 4x8 plywood; the smaller bed in four-door Colorados isn't much smaller at five-foot, one-inch. In a Car and Driver comparison test, the Colorado finished fifth out of the five trucks tested. Reviewers blamed the Colorado's cheap interior, rough engine, and uncomfortable rear seats as the main culprits. Edmunds was left wanting thanks to the Colorado's lack of seating comfort and cheap cabin materials. Chevrolet loses marks for giving "the impression of being cheap," with Edmunds also noting "sub par materials, an abundance of hard plastic and mediocre seat comfort." Automobile Magazine finds the upgraded front bucket seats will have you calling your chiropractor after driving stints of two hours or more. ConsumerGuide is pleased with the Colorado's legroom and headroom up front, finding its seats adequately comfortable on long drives. Kelley Blue Book agrees, claiming the durable seats are also comfortable, with acceptable lumbar support and firm bottoms. ConsumerGuide faults the Colorado's small, uncomfortable, and freighteningly upright rear seats. Getting to them is also a challenge, as "entry and exit is difficult through small door openings." As with legroom, storage is limited, although this is less of a problem on the Extended and Crew Cab models. TheCarConnection.com also finds adequate space in the Crew Cab's backseats for two adults, although the cushions are a bit flat. It can be said that build quality is commendable despite the use of cheap materials, with Kelley Blue Book reporting that "even over washboard roads, the Colorado exhibited no sign of dash-rattling or squeaks." Edmunds finds that the Colorado remains "relatively quiet around town," with "wind noise around the doors picking up at highway speeds." The 2010 Chevrolet Colorado isn't top-notch, but it has a good list of safety features, powerful brakes, and an advanced electronic stability control system. All 2010 Chevrolet Colorados are equipped with StabiliTrak as standard. A new braking system, first introduced last year, improves brake-pedal feel and stopping performance. Edmunds' reviewers are pleased with the inclusion of "OnStar emergency communications" as a standard feature. 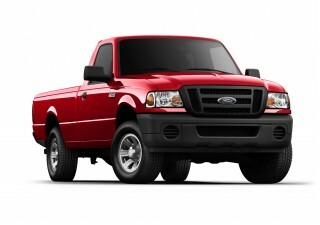 Other standard items include anti-lock brakes, stability control, traction control, and side curtain airbags. The 2010 Chevrolet Colorado four-door achieves a five-star score from the National Highway Traffic Safety Administration (NHTSA) in frontal crash tests and four stars in nearly all remaining categories. The Insurance Institute for Highway Safety (IIHS) finds the Colorado "good" in front impacts, but "marginal" in its seat-based rear-impact test. The 2010 Chevrolet Colorado offers enough as a work truck, though those in need of all the nifty extras will be a little disappointed. 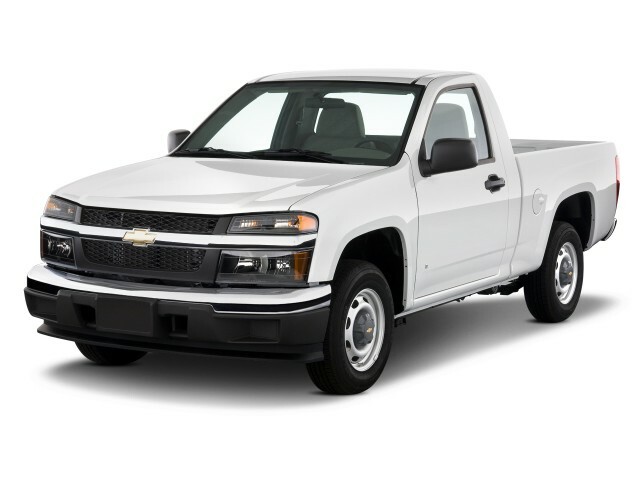 The 2010 Chevrolet Colorado offers most of the basics for a compact pickup truck, but the options are rather limited. Car and Driver moans over the lack of "some truck-specific options" on the 2010 Chevrolet Colorado, such as "no protective coating or tie-down rails in the bed." From the options list, Cars.com makes note of the Colorado's available heated leather seats, satelline radio, and locking differential. Edmunds is a fan of the Chevrolet Colorado's optional 18-inch wheels, bed extender, and grille guards. Unfortunately, navigation and Bluetooth are conspicuously absent from the options list. Edmunds claims that the interior of the base Colorado is "pretty Spartan aside from air-conditioning and an AM/FM stereo." However, it should be noted that the base Colorado also includes features like air conditioning, tilt steering, cruise control, and a pair of 12-volt power outlets. Moving up to the LT adds reclining seats, more stereo speakers, and aluminum wheels, which Edmunds believes "is a better choice for most folks." Extended and Crew Cab models can also be optioned with the new ZQ8 suspension package, which offers 30-percent stiffer springs, a 1-inch suspension drop, 18-inch aluminum wheels, and low-profile performance tires paired with the Colorado's available V-8 engine.